This is just the cleaning list. 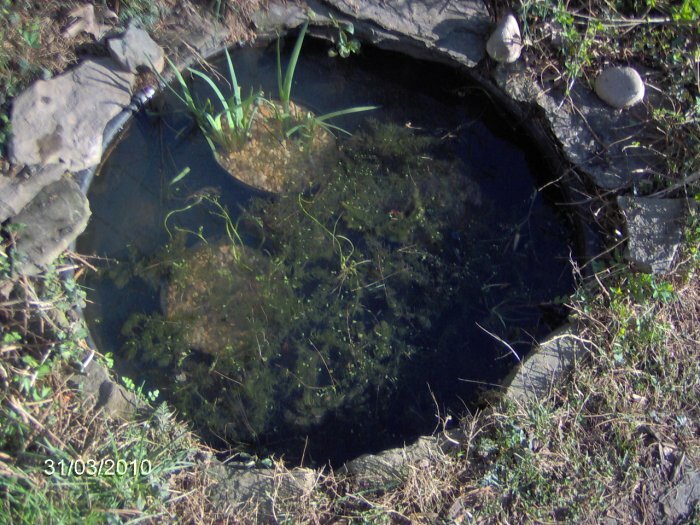 To see information on the 153 gallon pond's statistics, history, and past cleanings, go to my 153 Gallon Pond Section. 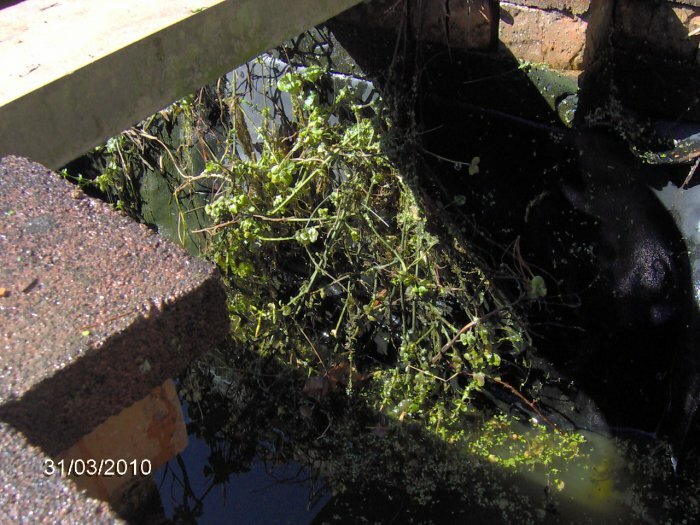 I used the 2009 pond cleaning page as a guide to write this 2010 one but did change everything that was relevant or changed. 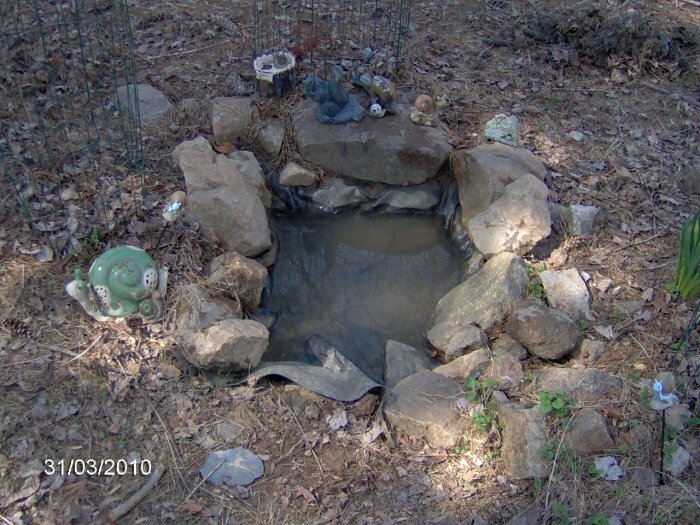 On 3/31/10, I cleaned out my 153 gallon pond. It went pretty much as planned. I got up at 6:30 am and finished the morning animal feedings at 8:16 am when I started collecting supplies. The air temperature was 48 degrees F, there was no rain, and there was a little bit of a breeze so I wore a winter hat. The 153 gallon thermometer read 47 degrees F at 9:05 am. I was ready to start bailing at 9:05 am. I bailed water into my two old kiddie pools, the smaller kiddie pool, and two holding buckets (one for the fish, one for the frogs). The water was green from suspended algae. The rosy red population was really down this year but I found six frogs. Three of them were in the waterlily pot in the dirt; the waterlily pot was tipped on its side. The bottom of the pond was full of the aquatic plant soil and pea gravel because the raccoons had de-potted most of the pots and made a huge mess (but less of it than last year). I cut some mint around the pond by standing in the empty pond. The mint grows in to the pond from all directions. I replaced four bricks under water that had fallen apart and none of the brick cap stones (pavers) although one is really off kilter (not sure if I could have fixed it). 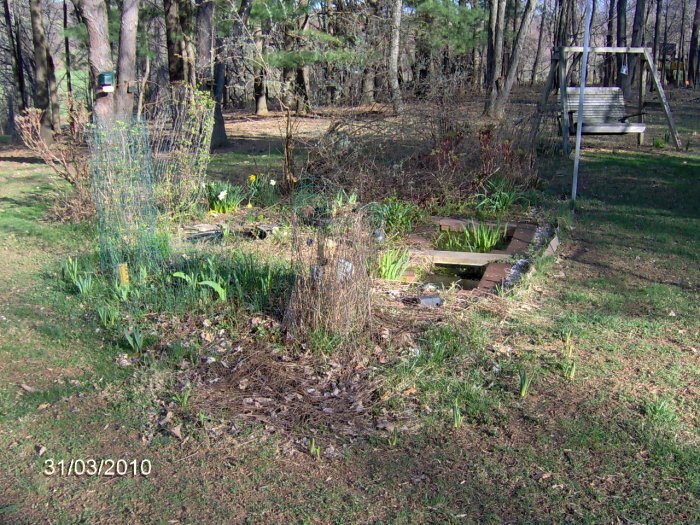 When I clean the pond, I bring up buckets and then go sit down on a gardener's kneeling pad. When I start, there is little debris so I pour it through an aquarium net and then look for movement. This year, that meant a lot of minute newly-hatched wood frog tadpoles which I had to pick up delicately. I lost an untold amount because they tend not to move when they are out of water which makes them even harder to see among slop. They are also easily squished and killed. By the time I get to the bottom of the pond, there is so much debris that I net what I can and sift through that but eventually just have to pour blobs of gravel and slop on the ground and pick through it to find the animals I list below. I hand pick out the snails, tadpoles, minnows, worms, and insects. In the process, I miss a lot of the snails, tadpoles, and insects. I am sure I did not miss any frogs or fish. I pulled off large cascades of terrestrial mint growing in to the pond. They are a great filter but they will take over if not trimmed. It will not take long for them to regrow. By 12:08 am (12 minutes later than last year), the pond was fully empty but not yet cleaned. I went inside to eat lunch and clean up a little. By 12:27 pm, I was back outside. The air temperature was up to 62 degrees F (12 degrees warmer than last year). About 1/2 cup of pond salt (~25% of the recommended dose on the container for ponds with plants; half as much as I usually put in), a half teaspoon of BZT, a dose of pond Stress Coat (old, no longer sold), a dose of aquarium Stress-Zyme, and a dusting of baking soda. I also put in the little barley straw pad in its holder. I got the PondMaster filter and bell fountain going and let the Luft pump heavily aerate. 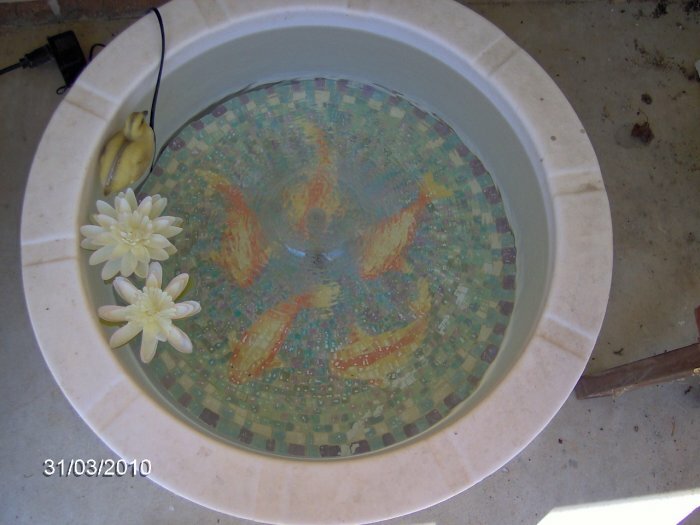 I squirted off the fake koi (used to float but now it sinks) and three clay pots (spawning sites for the rosy red minnows) and put those back. Then, I repotted the plants. On the bottom was one two gallon pot of waterlilies. It was tipped over with three green frogs hiding in the dirt. I cut the roots and tuber a bit but neither of the two growing tips. I potted that lily with clay dirt from our old garden instead of Aquatic Planting Media. I topped it off with pea gravel and gave it two Pondtab fertilizer pills. In order to put it back in the deep end of the pond, I rolled up my pants, took off my boots and socks, and put on water shoes so I could step in to the very cold water. I brought a towel to dry off. In the overflow was a two gallon pot of iris. I saved about a third of it. The other pots consisted of two two gallon and one one gallon pots of various water iris. I had a lot of iris. I saved about half of the iris and potted them back in the same pots. I used Microbe Lift Aquatic Planting Media for those in anticipation of the raccoons tipping them over although these pots I was repotting were still intact for once. It seems the iris roots do not really take hold in the loose planting media like they do in dirt. This kept their growth rate down which makes it easier to control them and repot them. On the other hand, it means no flowers. I put two two gallon pots and one one gallon pots back in the 153 gallon pond. 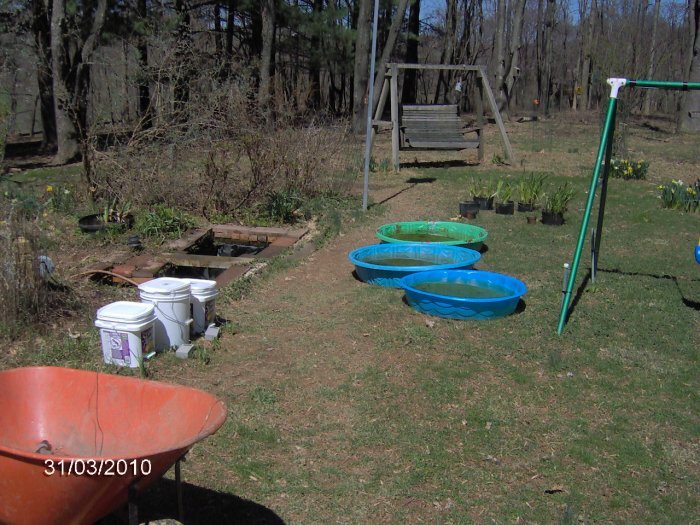 Once the plants were redone, I bailed the water, animals, and plants from the three kiddie pools back in to the pond. This year, there was a nice handful of hornwort left and a few tiny sprigs of anacharis. Last year, I had none of those, just tons of terrestrial mint which I saved last year. This year, I saved none of the mint in the water because I know it will soon grow back in to the pond. All the saved water, mint, snails, tadpoles, insects, fish, and frogs were back into the pond by 1:43 pm (better timing this year). The water temperature was warmer (forgot to write the number down though). I can no longer find pink quartz gravel which I love so this year, after removing leaves and some weeds, I put fresh regular pea gravel over the pink quartz gravel along the east and south sides of the pond. The other two sides abut the earth directly. They are not even mulched because I never got to it and could not do it now really due to the enormous amount of weeds there. 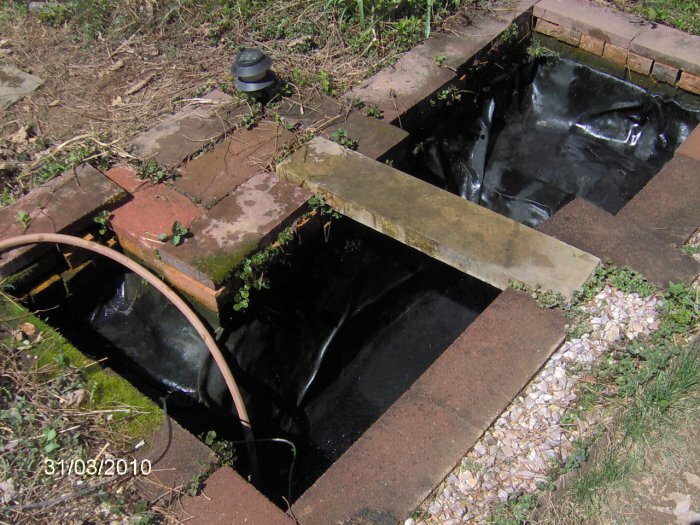 I then cleaned the back 16 gallon liner pond by hauling out the extension cords and three hoses. I hand lifted out probably 10 gallons of leaves and ew. A few rocks had fallen in so I tried to fix those as well as pulling up the liner which continues to collapse in to this little pond. Using the Pondovac and hose, I cleaned it as best I could and refilled it. 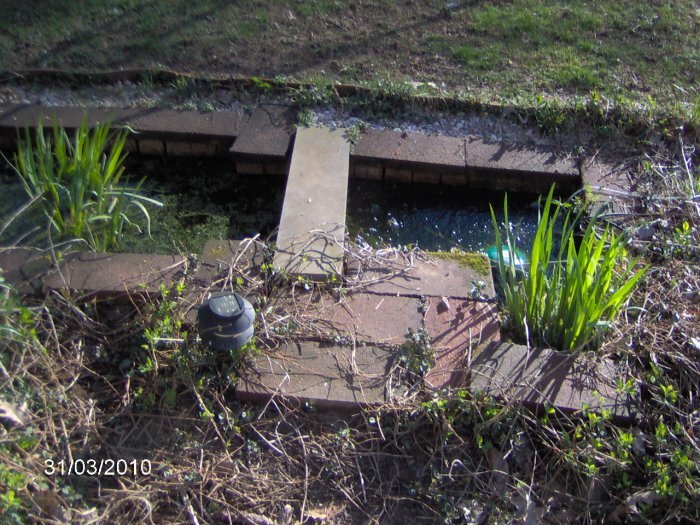 I then filled up the front mosaic pond with water. I started the clean up at 2:53 pm, and it was done around 4:05 pm. It takes that long to put all the supplies back and clean all the buckets, etc. The air temperature got up to 67 degrees F! It is supposed to be near or above 80 degrees F for a few days, too hot for me. After that, I did my afternoon chores, showered, and came to write this page up (first pass through) at 5:10 pm. After I do that, I plan to eat dinner, do my e-mail, and watch tv. This year, the pond has a few dozen smaller pieces of hornwort and just a few anacharis pieces. I did not save any terrestrial mint this year. I used Microbe-Lift Aquatic Planting Media this year to repot all the pots in the 153 gallon pond except for the waterlily. I pre-wet the aquatic "soil" in one bucket and pea gravel in another. I filled each pot with the "soil" and then put in the plant, a PondTab fertilizer pill (one per gallon), and topped off with pea gravel. Because iris bloom in May, in repotting them in late March, I get very few flowers. Here are the plants that I repotted. I started with four pots. One was the blue iris which was in great shape and sits in the small marginal shelf by the overflow (it takes up the entire shelf). In the deep end of the pond was one two gallon pot. 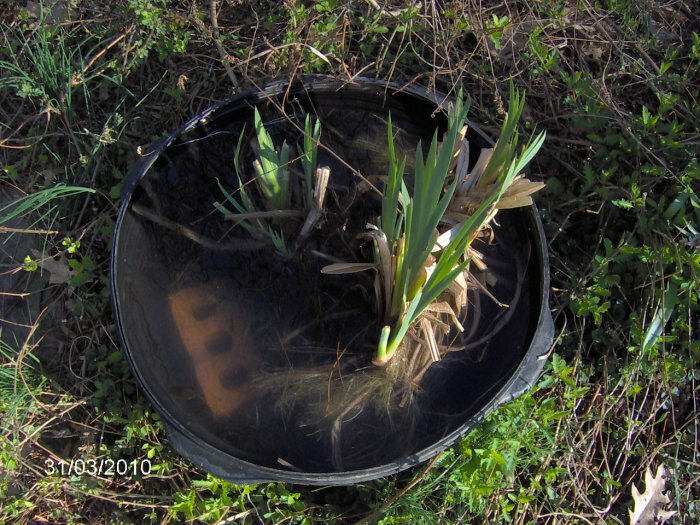 In the main marginal area, there were one one gallon pot and two two gallon pots all of iris. In the 153 gallon pond. Multiple clumps of terrestrial mint dripping with hair algae - discarded. One two gallon pot with a waterlily in the deep end. It is probably the Albata white lily since it is the most vigorous. One two gallon pot with iris on the overflow shelf. Two two gallon pots with the same iris in the main marginal area. One one gallon pot with more iris. Here is what I found in the pond! I had to hand pick through every bit of slop to get all these animals. 24 rosy red minnows (down from 42 the previous year) - approximately 7 males, 10 females, 6 juveniles, and 1 fry. Last year, I had a lot of tiny fry but just one this year. One of the adult females was half black and half orange (this was noted in a juvenile last year so it is the same fish)! Many of the adults had brown spots. It seems that the rosy reds and reverting back to fatheads. I really like the splotched ones. I also found one dead rosy red, a female who seemed normal. 6 green frogs - 2 males, 3 females, and 1 juvenile. 2 dead frogs - 1 3" pickerel frog, 1 3" female green frog. ~40 green frog tadpoles, most of them small, maybe one larger one. No bullfrogs or wood frogs. ~100 wood frog tadpoles that hatched a few days earlier out of untold numbers. This year, I did not get to move the eggs before they hatched. There should have been more. 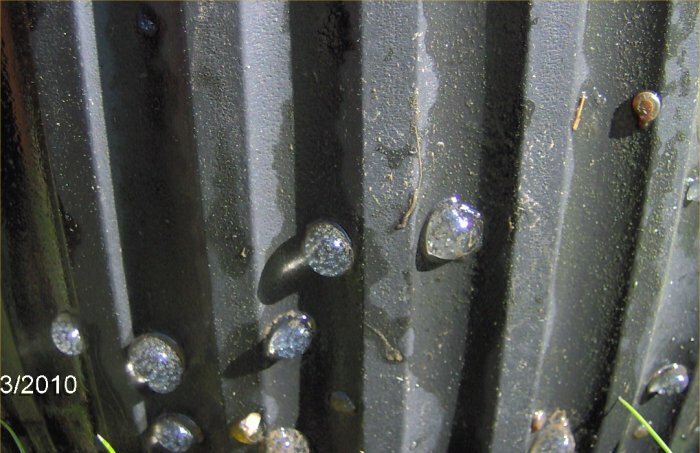 It is very hard to remove them without physical damage and many died. 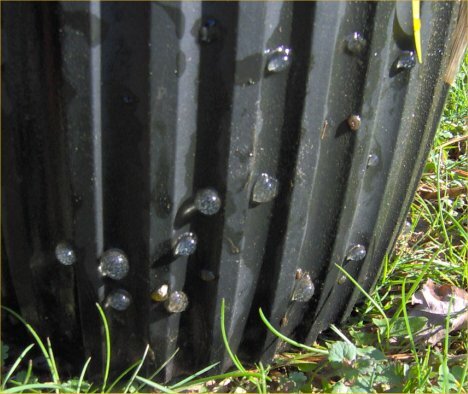 ~300 ramshorn snails - tons of them! A few dozen or so pond snails. No Melantho snails (but they are in the 50 gallon tub pond). 10 live cranefly larvae and 2 dead ones. 1 aquatic worms that was very skinny and black (not earthworm and not blackworm). 1 aquatic adult beetle with brown stripes. ~20 slimy, terrestrial earthworms which I did not return to the pond! They got to go back to the earth. I am so glad there were not hundreds of them like in previous years. The interesting finds for the year were the spring from gardening pruners and a dead slug. All of these photos were taken on 3/31/10. Ponds - before cleaning was begun, facing north from a distance. 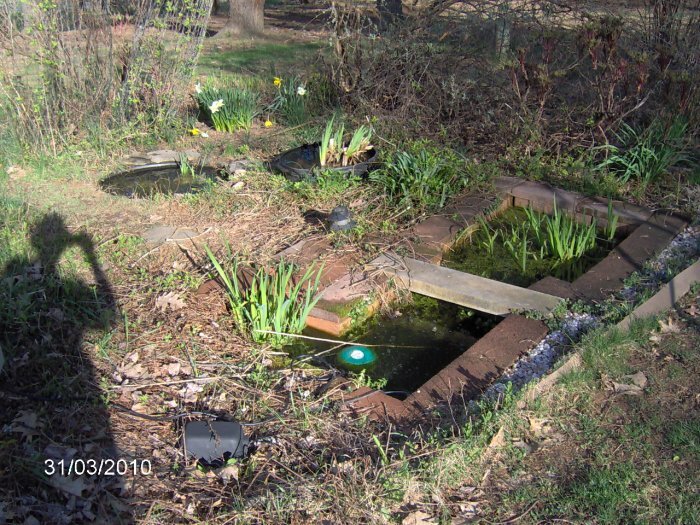 Ponds - before cleaning, facing northwest, next to 153 gallon pond. 20 gallon tub pond - cleaned three days earlier. 50 gallon tub pond - cleaned three days earlier. 153 gallon pond - facing east. 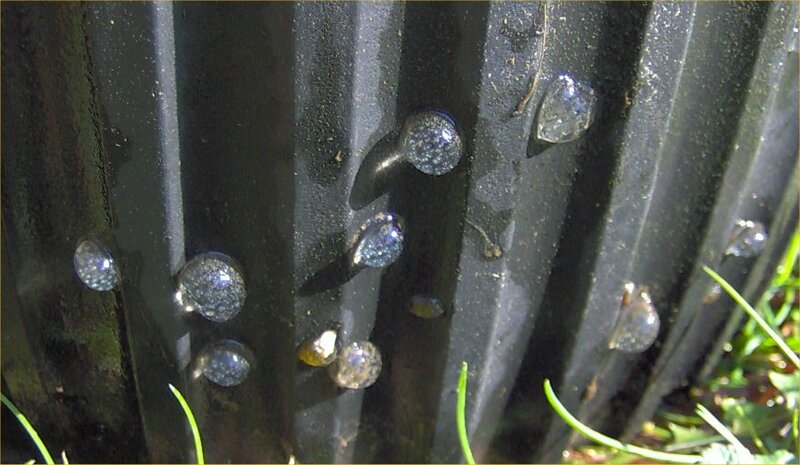 Snail eggs on a two gallon Lerio pot. Terrestrial mint - hanging/growing down in to the almost-empty 153 gallon pond; I had already pulled a bunch out before the photo. Back yard with all the kiddie pools full and the 153 gallon pond empty. 153 gallon pond - mostly empty since it was being re-filled with water, view from the south end. 153 gallon pond - mostly empty, view from the north end. 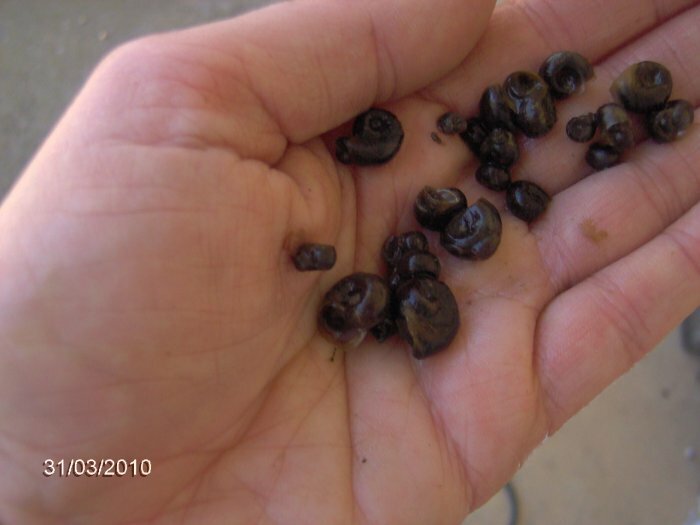 Black ramshorn snails in my hand; a few of them before I put them back in to the pond. 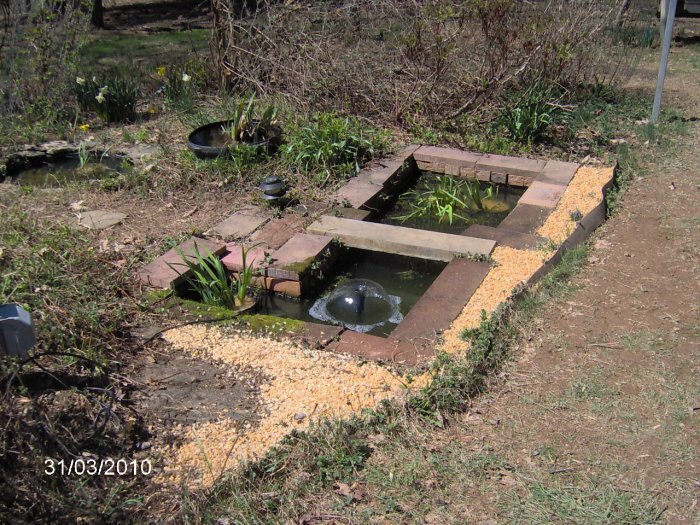 153 gallon pond - all re-filled and with new pea gravel edging; the tub ponds can also be seen, facing north. Mosaic pond - set up on the front porch. 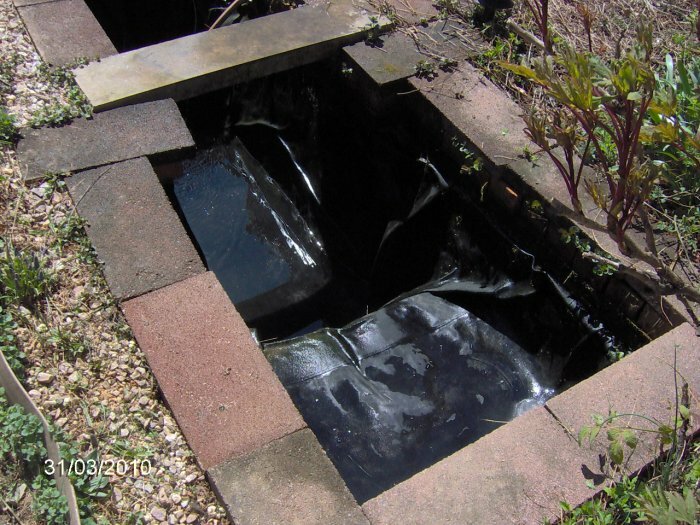 16 gallon liner pond - cleaned and re- filled at the back of the property. I took this video when all was done. 153 Gallon Pond - 3156 KB, mpg movie.